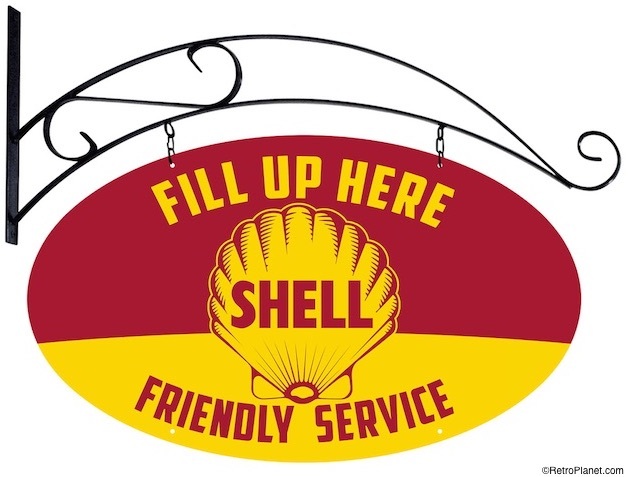 This variation of the Shell Oil Company logo was created in 1961. 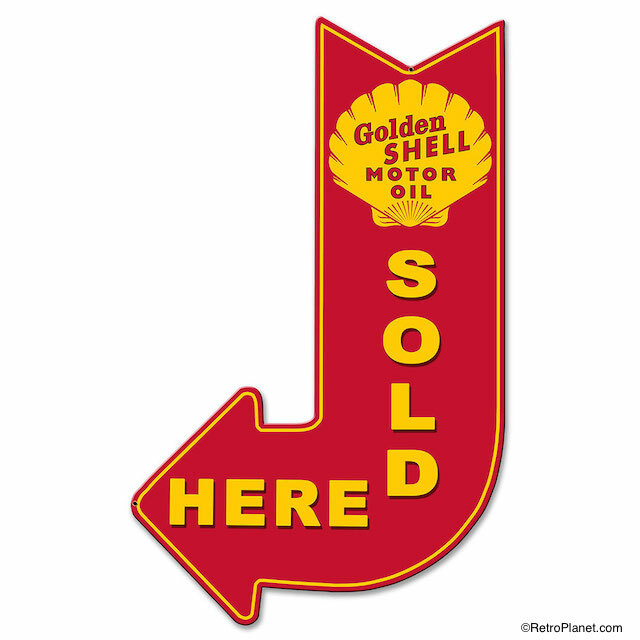 Check out our brand new Shell gas and oil signs. These vintage style reproductions feature all of the antique charm of the original British adverts, without the antique store price tag. Garage sale shopping from the comfort of your living room. Each wonderful, old fashioned design is artfully distressed with the perfect amount of rust, dents, and dings for authentic looking wear and tear, just like it was found behind an old truck stop on Route 66. See for yourself. 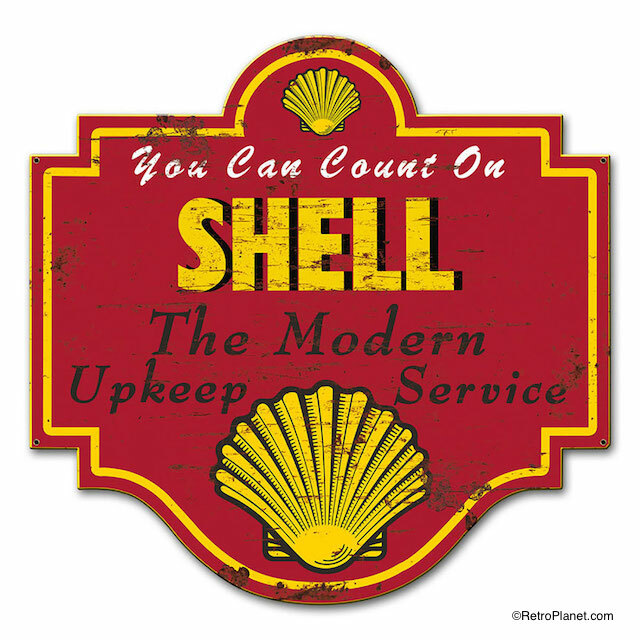 In 1930 the Shell Oil Company redesigned their logo with an art deco aesthetic. The signs are made of heavy-duty American steel, which means one thing, and one thing only: Quality. Using a manufacturing process known as sublimation the image is baked directly into the powder coating for a highly durable, long lasting finish. No fading, no blemishes, and absolutely no disappointment. Made in the USA! 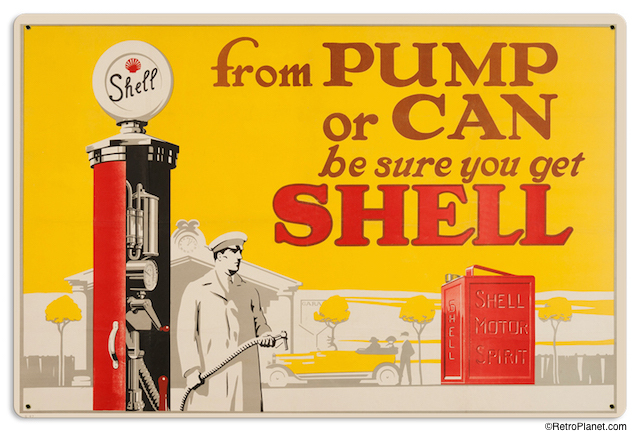 These reproduction steel signs feature vintage Shell gas and motor oil ads from about 1923. It’s always a good time to fuel up your decor. Get a couple for your garage, man cave, or repair shop, or add another conversation piece to your gas and oil collection. These artfully distressed pieces look so much like vintage originals, you can display them with your other petroliana collectibles. Not half bad for bar or diner decor, either. Whether you enjoy retro automotives or old school advertisements, these signs are sure to please. Talk about super premium. 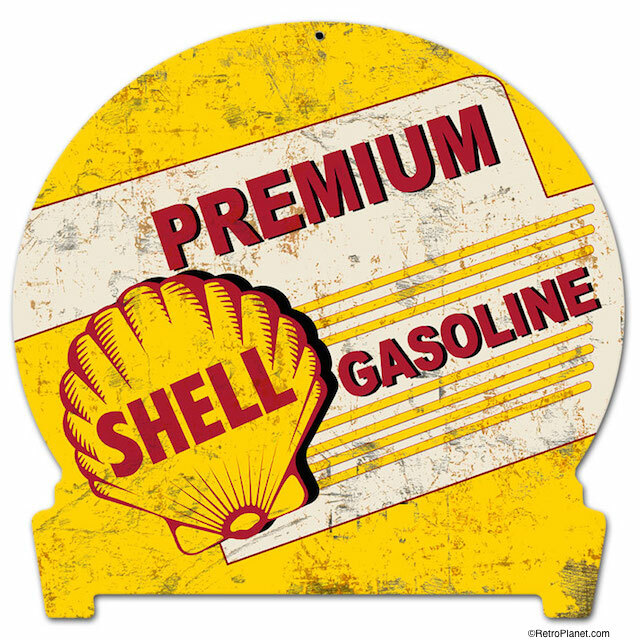 These styles of Shell gasoline signs were displayed in gas stations about 1950. 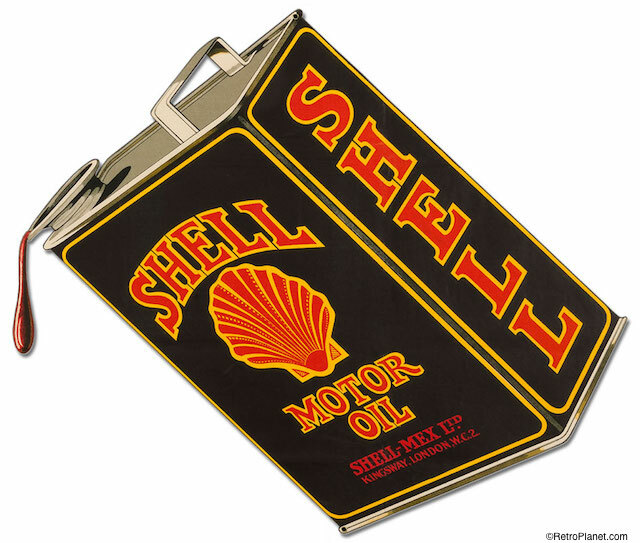 Shell is one of the oldest, well-known brands for consumers and collectors alike. The popularity of products like these signs proves it. Some people simply like them for their looks, others for the nostalgia. There certainly is a lot of history to be learned from days gone by. 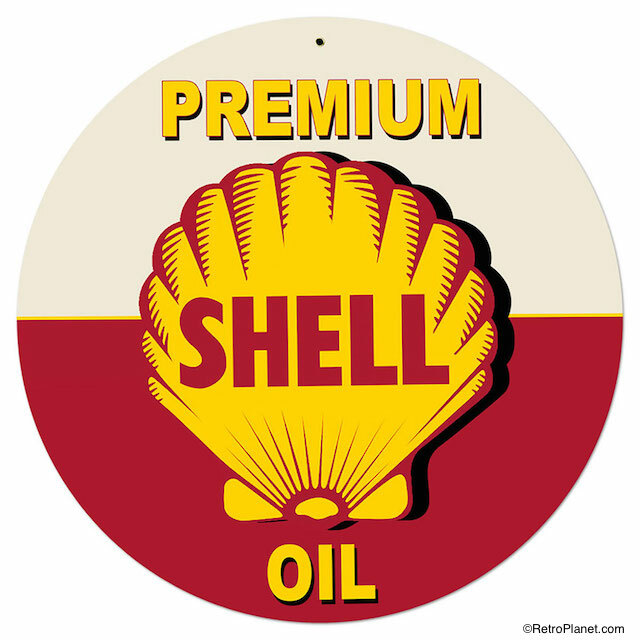 So history buffs, do you know where the name Shell comes from? 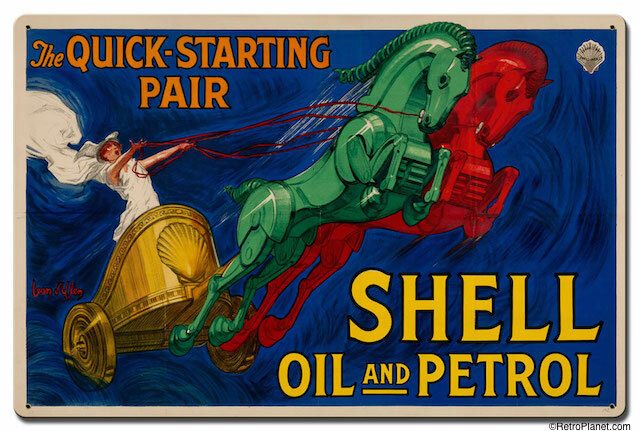 The slogan, “The Quick Starting Pair” was a very popular one for the Shell Oil Company. 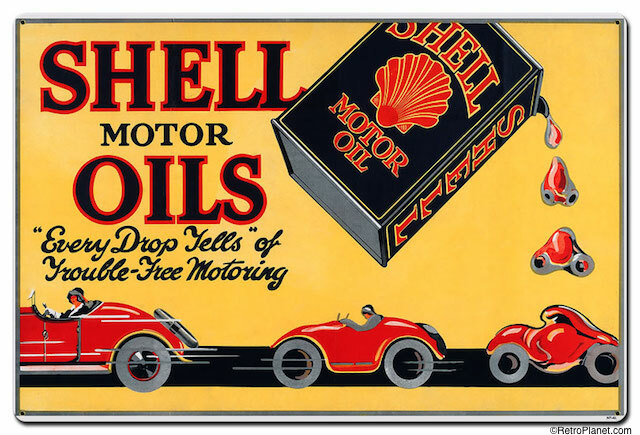 The ad featured on this reproduction sign was released in 1927. 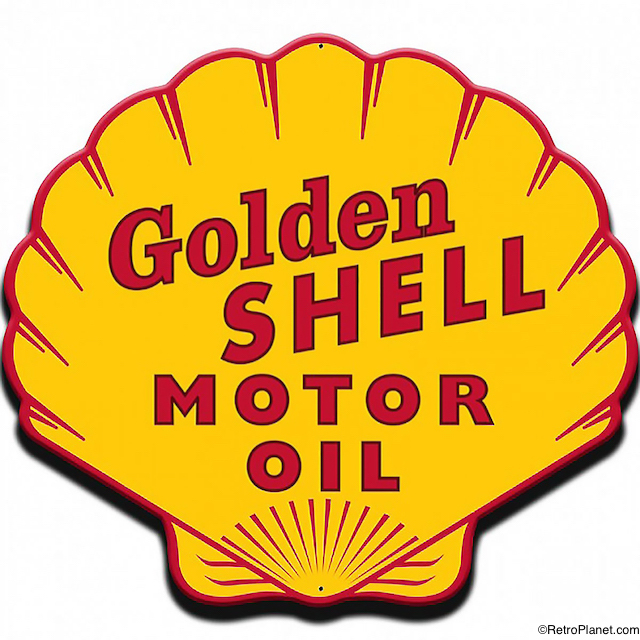 The Golden Shell logo was used in the 1940s. Sit back and relax, because it’s time for a quick Retro Planet history lesson. Legend has it that back in the nineteenth century, Marcus Samuel owned a family import/export business in London which sold oriental painted seashells. The story goes that while on a business trip to Japan, Marcus Samuel the younger was struck by the potential of oil trading. Years later, the future oil company was named after its symbolic, and most likely sandy, beginnings. A much better name choice than Scallop, in our opinion. Got something to say, perhaps a little history of your own? Love the new signs? Let us know in the comments below!